angry chicken: cupcakes and dresses. I just got the new Good Things for Kids from Martha. I have all the old MSL Kids magazines, under lock and key, so I really like it when they do these best of issues because I really use them--I get all weird about the actual magazines and don't like to leave them out. 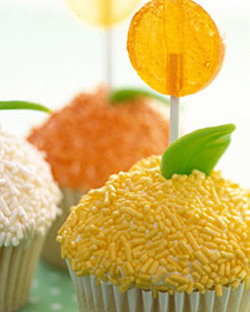 This lollipop cupcake (image from the website) kills me. The recipe is on the site. So much is on the MSL site! I could spend days there. We are already thinking about Sadie's big 5th b-day in the fall, so the timing of this party themed issue couldn't be better. And here's a plea to bring back the actual Kids magazine, please!! And thinking about Fall clothes, the new Miniboden came to the house last week and I want this outfit. For me. Oh, I mean for Sadie. But I need to get her out of the pjs and the life vest first. There are great sewing ideas in here, I always save the catalog for that reason. I actually have never ordered from them before, but the clothes seem well made-are they? Anyone know?